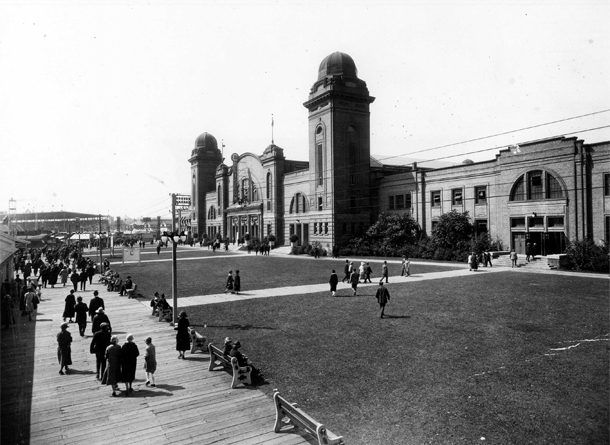 The Canadian National Exhibition has been a Toronto tradition since 1879. A lot has been written about what’s there now (yes, cronut burgers and smores hot dogs), but the history of the CNE is pretty fascinating. From theex.com: It was “the place” where people came to experience the latest innovations in technology and commercial products as well as performances by many of the leading artists of the time. Performers including Bob Home, Danny Kaye, Phil Silvers, the Three Stooges, Annie Oakley, Sergio Mendez and Brazil ’66 all appeared on the Grandstand stage in the 50s and 60s. Take a look at who was here between 1970-1994, though. There were headliners every night, from The Osmonds to Helen Reddy (at the height of their popularity) Frank Sinatra, the Bay City Rollers, Olivia Newton-John, the list is endless. It’s a little sad to look at the current lineup when it’s compared to yesteryear’s performers. No offense to the Fifth Dimension. There’s a whole website dedicated to the history of Exhibition Place and the CNE, including a virtual walking tour. They also have a Facebook page with some great vintage photos. Vintage Toronto also has a full photo gallery on the Ex from 1952 to 1991. And of course, if you want to find out what’s happening at the Ex this year, click here. It runs until September 2nd. Fun fact: almost 300,000 mini donuts are consumed annually at the CNE.